Since September, I’ve felt like I’ve been constantly moving. Whether it was driving down the west coast, or across the Nullarbor or the Great Ocean Road, or flying to Sydney and then flying to Hobart and roadtripping around Tassie. I have just over two months left on my visa and I’m staying in Victoria. I think Melbourne will always hold a strange place in my heart and it will be painted with bittersweet memories. Let me explain. Melbourne is the city where I’ve been reunited with a lot of the people I’ve met while on my journey. It will also be the place where I say goodbye to them for a while as Melbourne will be the last city in which I spend some time in Australia before I close this travelling chapter. 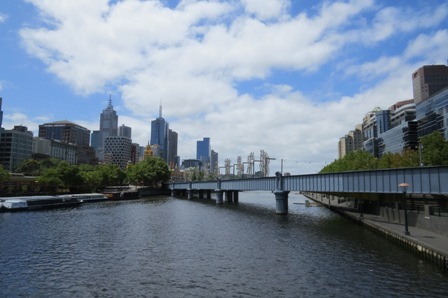 From what I’ve seen of Melbourne, I really like it. It seems a bit more ragtag than Sydney, with its winding laneways and huge array of different shops and restaurants. Before I came to Melbourne, I was told that I’d love the culture here, with all the art galleries, museums and libraries on offer. And they weren’t wrong. As an unashamed museum geek, I’ve spent a good few days on a tour of the galleries and museums here. The brilliant and thought-provoking Immigration Museum on Flinders Street was brilliant and one of the best museums I’ve been to while in Australia. ACMI was fantastic too and I managed to kill three hours there one cloudy morning. Having been in the CBD for just over a week, I’ve managed to see a lot of the city and even ventured out into the inner suburbs. I think, so far, my favourite was wandering down Brunswick Street, stopping off in any of the cafes that took our fancy and the sweet little shops. Carlton was also nice – especially Readings bookstore. 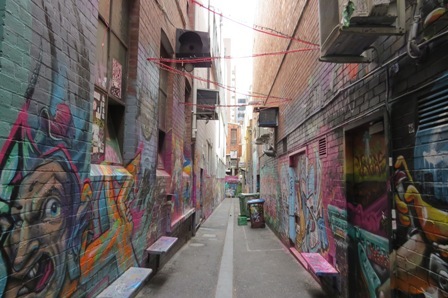 After reading an excellent young adult book (Graffiti Moon by Cath Crowley) about a graffiti artist in Melbourne, exploring the colourful laneways have been top priority for me when visiting the city. A friend of mine took me on the first part of my graffiti education around the CBD a few days ago. 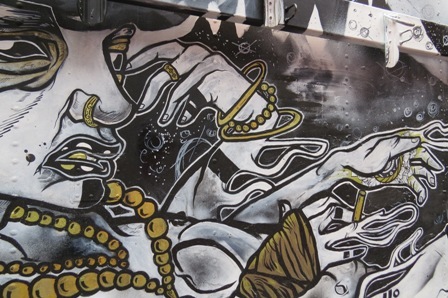 It’s crazy how you can be walking down one of the busiest streets in the city and then, simply by ducking down an alley way, you can see some of the most vibrant graffiti. I’ve been promised Melbourne Graffiti Tour Part 2 soon and I can’t wait. As I mentioned earlier, Melbourne is the city where I’ve been reunited with a lot of my past travel mates. Luckily Melbourne isn’t short of places to meet for lunch or coffee. It seems there are more cafes in Melbourne than, well, pretty much anything else in this city. I’m genuinely concerned that when people ask me what I did in Melbourne my answer will mostly involve what and where I ate. This weekend, a few of us went to Phillip Island to take advantage of the sun. I’d been to Smith’s beach on the Saturday before Australia Day and it was packed full of people celebrating the long weekend. Luckily the beach we headed to this time was a little less busy and we could turn over without asking our neighbour if they were ready to turn too! After a very taxing day of lying on the beach and watching the surfers in Woolamai, we headed to Cowes and ate ridiculously large ice creams as the sun set. The next day, after camping on the side of the road like the good old west coast days, we headed to Inverlock in hope of 32 degrees. I had been warned about Melbourne weather and how it basically does whatever it feels like doing from hour to hour and Sunday was no exception. So instead of a beach day, we played Frisbee in the park and got fish and chips. Next on my agenda are the Grampians. After being in the Big Smoke for a while, I’m craving mountain air and bush walks. I can’t wait! 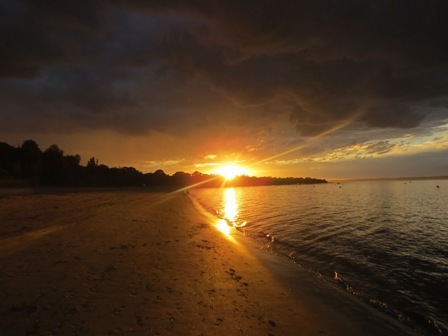 This entry was posted in Travel and tagged australia, on my own, on the run, travel. Bookmark the permalink.